The key word in that headline: Minor. Don't expect much here — just a few unsettled hiccups over the next few days. Sure, light snow accumulations will be a possibility. But there are no significant snow (or rain) threats in the forecast. We find ourselves in a lovely slice of the atmosphere on this Thursday, considering it is mid-February of course. Thursday morning will bring mostly sunny skies, a continuing stiff breeze, and temperatures in the 30s. Thursday afternoon, we'll see increasing clouds, we'll feel calmer winds, and temperatures will end up in the mid 40s. Date night Thursday night also looks good. Mostly cloudy and dry, with lows in the mid to upper 30s. Temperatures will probably begin to rise slowly after Midnight. An approaching cold front is expected to drive scattered rain showers through New Jersey throughout the day on Friday. Best chance for rain will be northern and central NJ. When it's not raining, skies will become cloudy. It's not all soggy news for Friday, however. Pre-frontal passage, we'll see a nice little warmup. High temperatures will range from the upper 40s (far north) to mid 50s (central) to upper 50s (south). 60 degrees can't be ruled out! First of all, the weekend will turn much cooler again, with residual cloudy skies. Highs on Saturday afternoon will be limited to the lower 40s — pretty typical for this time of year. In addition, a little shortwave (storm system) is going to come very close to clipping South Jersey during the day Saturday. 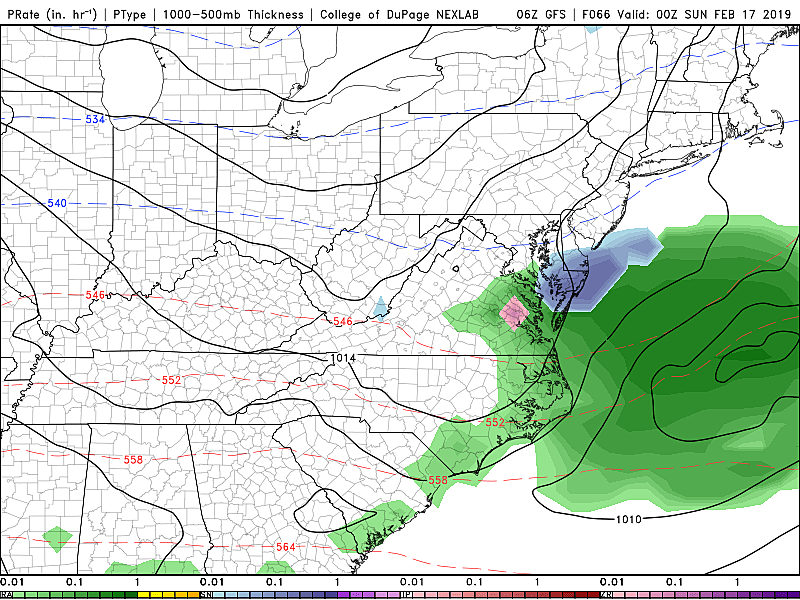 It's still not a guarantee: The Euro model shows everywhere south of Interstate 195 seeing a brief pop of snow, the GFS model shows snow showers only Cape May County only, and the NAM model depicts a complete miss. In any case, snow accumulations will be geographically limited and light. Maybe a half-inch to an inch, at the most. Visibility may be reduced in pockets of heavier snow (if they stretch this far north). But I do not anticipate any significant travel issues, even if the most widespread Euro solution plays out. 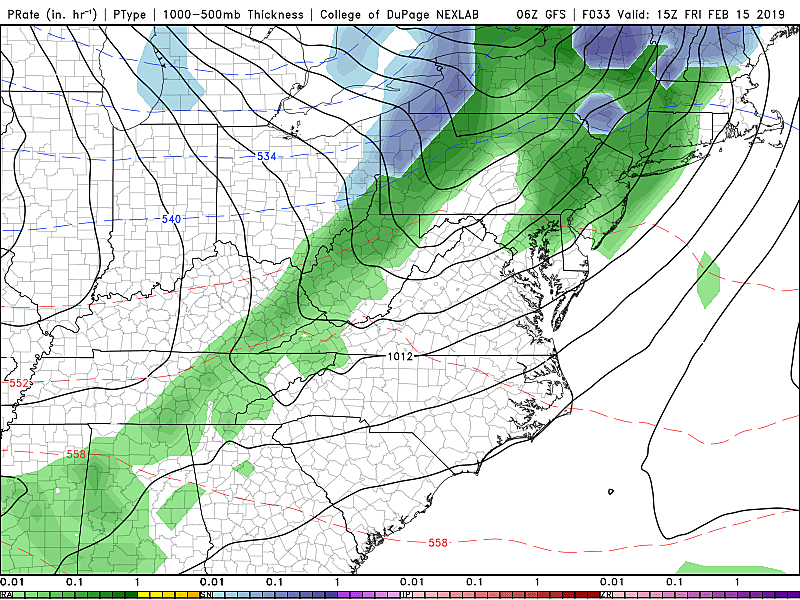 GFS model forecast for storm system #3, a clipper system bringing mixed snow and rain to New Jersey late Sunday night. Sunday daytime doesn't look half bad, as partly to mostly sunny skies return to New Jersey. High temperatures will remain near-normal, in the lower 40s. Our next next next next storm system arrives next Wednesday. 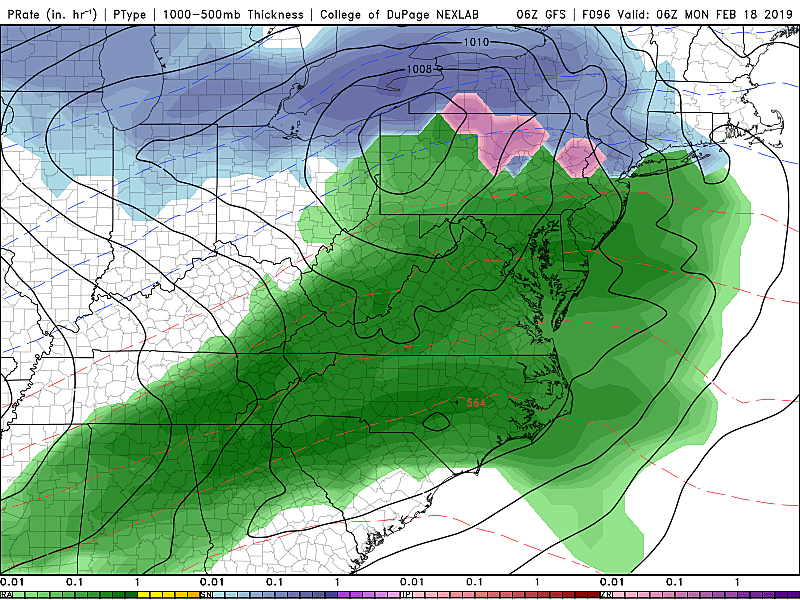 Looks like another mix of rain and snow, with accumulations possible. We'll nail down that forecast as it gets closer.